House Reckoning takes us to New York City, and we learn more about DeMarco’s childhood, his father and the lasting impact of discovering that your father is a hitman for the mob. New evidence emerges that finally lets DeMarco know what happened to his father — who killed him. The man in question is a rising star in law enforcement, tipped to take over the FBI any minute. Going rogue (and fired by Mahoney), DeMarco decides to get justice on his own. Along the way, he has to navigate aging mobsters, double-crosses and a driven, borderline sociopathic antagonist who will allow nothing to get in his way to the top. Aided by friends and long-time allies (not always in ways he would appreciate), DeMarco becomes a hunted man in NYC. As it turns out, though, he’s just as driven as his nemesis. I wasn’t sure what to expect from this novel — it was the first that wasn’t explicitly politics-focused, as the previous eight novels have been. But, the relatively straight-forward crime plot works extremely well, and I devoured the novel in three short reading sessions. It’s gripping, well-paced, and I especially enjoyed the flashback scenes, which fleshed out DeMarco’s back-story. A must-read for fans of the series, and a welcome shake-up of the series. As a fixer for influential congressman John Mahoney in Washington, D.C., Joe DeMarco has found himself in plenty of unexpected and dangerous situations. 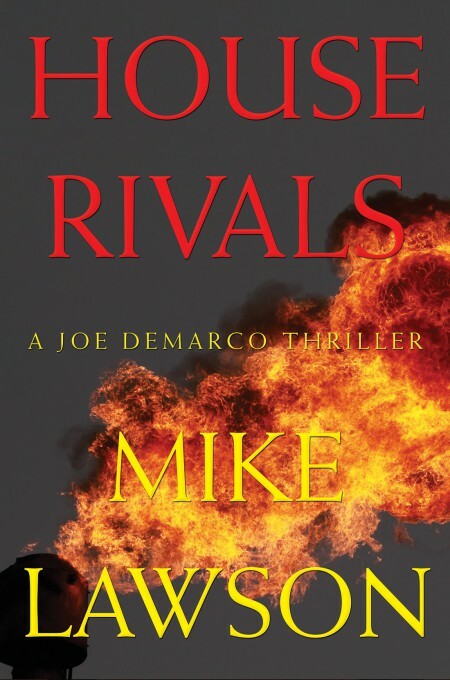 In House Rivals, the tenth book in Mike Lawson’s award-winning series, DeMarco is taken further out of his element than ever before, sent to North Dakota to protect a passionate but naive twenty-two year-old blogger who has put herself in harm’s way. The young woman is Sarah Johnson, whose grandfather saved Mahoney’s life in Vietnam. For the past two years, Sarah has been on a relentless crusade against a billionaire oil tycoon who has profited handsomely from the natural gas boom in the Dakotas — and who she believes has been bribing small-time politicians and judges to keep things in his favor. Though she has no hard evidence against the man, Sarah has been assaulted and received death threats for her meddling. DeMarco, given his years of experience bending the rules in D.C., suspects that a middleman like himself is pulling strings for the tycoon. But as DeMarco tries to identify his adversaries, the situation turns unexpectedly violent, and DeMarco finds himself in a battle of wits against two ruthless problem solvers who will stop at nothing to win. As with House Reckoning, the tenth novel took DeMarco out of his comfort zone — this time to North Dakota. Sarah Johnson, daughter of a friend of former-Speaker Mahoney, is digging in to a frakking tycoon: he’s your typical corrupt one-percenter, and she’s going out of her way to cause trouble for him and unearthing any and all dirt she can. Unfortunately for Sarah, she’s not making much of a splash with her blog: she’s brash, quite rude even to people she wants information from, and… well, she can’t write. She peppers her work with supposition and inference, with little-to-no substantiating evidence. What’s awkward, though, is that she’s right. Her lack of an audience, however, is irrelevant to the billionaire who wants all dissent squashed. With the help of two political fixers, this leads to a number of overreactions which, handled by a different author, might have seemed incomprehensible. However, Lawson builds the novel well, tapping in to the likely flaws of someone with a near-unlimited fortune, great influence and comfort in getting his way. Unfortunately, DeMarco is on the scene and after the story takes a dark turn, he finds himself pulled into her crusade — while not a convert, his sense of justice drives him on. That being said, what was interesting here is that DeMarco is not a law enforcement official. Unlike most other crime thrillers, therefore, our protagonist is not bound by the ethical restrictions of a cop or FBI agent (or whoever else it might be). Naturally, this means DeMarco engages in a fair bit of unethical, borderline illegal (and definitely illegal) activities that get him the breaks he needs to move his independent investigation forward, and also help the FBI, who are eventually called in. It’s engaging storytelling. The novel is fast-paced, and includes a twist at the end that I thought was rather excellent. I enjoyed the shift in location from the East Coast and DC to North Dakota (and Montana), as it presents some new obstacles and imposed some limitations on DeMarco’s ability to operate. True, the long reach of Washington influence is still evident, but he’s on foreign ground, and is kept pretty well on his toes. An enjoyable addition to the series. I can’t wait to read the eleventh. Very highly recommended to all fans of thrillers and political thrillers. 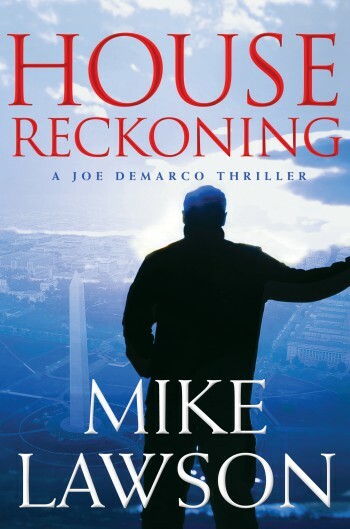 Mike Lawson‘s House Reckoning and House Rivals are published by Grove/Atlantic.